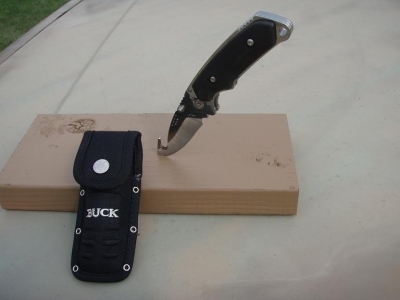 Montana Test.com - Results for: Buck Knives Alpha Hunter Guthook, Rubber! Check Out Over 200 Bucks Knives in our Store! Buck Knives Alpha Hunter Guthook, Rubber! All Buck Knives and Multi tool performed under an assortment of conditions, hunting and camping. We put both Alpha hunters to the test cutting steak on camping outings and field dressing Deer, Elk, and Antelope. All our testers reported to me a good test, and the sharpener’s was a great tool for the field. Any blade will dull over time and especially on big game animals, have a sharpener with you; it helps keep an edge on the knife and makes your field dressing a whole lot faster and easier. Full tang construction and ergonomic design makes this the premier hunting knife for any big game hunter. The contoured handle and grip ridges integrated into the top of the blade tang make maneuvering through field dressing a breeze.